Yes, These Luftwaffe Oddballs All Flew! The Luftwaffe had excellent airplane designers. Unlike some other areas of the Hitler regime, these innovators were given absolute latitude to do pretty much whatever they wanted. As long as the design promised to be effective it stood at least a chance of being approved. While it is easy to point to some failures and conclude that this was a mistake, in fact several excellent and even revolutionary designs flew before the end of the war. There were many crazy (and some awesome and far-sighted) designs that remained only on paper. 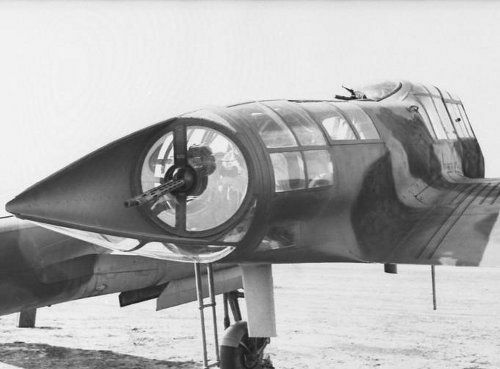 Here, we look at odd German planes that actually flew. 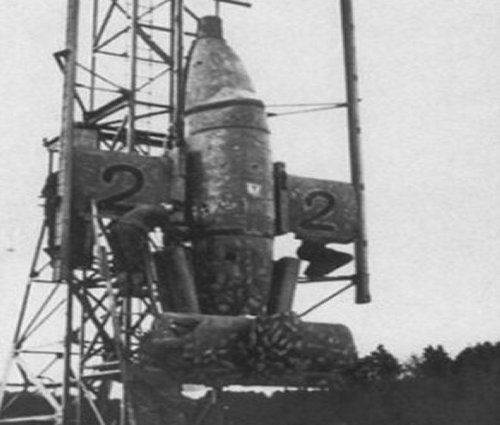 A Bachem Ba-349 on the launching tower.This is probably the second protoype. The Bachem Ba-349 was the first VTOL (Vertical Takeoff and Landing) winged aircraft in the world. Towards the end of the war, the Germans developed unusual planes to meet very precise needs. The Bachem Ba 349 Natter came close to filling two of them: a fast interceptor which did not require a long runway. The second requirement was important because the Allies had complete air superiority by 1945 and were feasting on superior German fighters during their vulnerable takeoff and landing phases. In early 1944, the writing was on the wall in terms of which way the air was was headed. The Luftwaffe put out a tender for a point-to-point defense interceptor. Erich Bachem, a former Fieseler designer who had founded his own spare-parts company, Bachem-Werke GmbH, submitted a radical proposal. It was a mostly wooden plane (the only plentiful material) to be powered by a Walter HWK 109-509A-2 rocket motor. 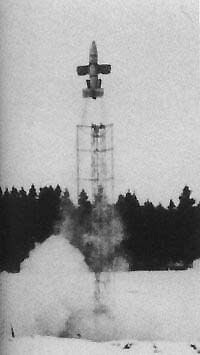 The most radical aspect of the design, though, was not the rocket motor, because other designs featured that; it was the vertical take-off capability. The exotic plane was to be guided to its target by either an autopilot or a guidance beam. The pilot would then fire rockets to take down the bomber. Heinrich Himmler loved the idea, and the Ba 349 became a Waffen-SS project. As such, it was within the purview of the infamous Hans Kammler, the "special projects" guy of the SS. The Reichsluftfahrtministerium (RLM) kept an eye on the project, but it was funded by the SS. With the war going badly, SS projects got top priority. After Himmler approved the project in mid-September 1944, Bachem had a prototype in the air by 4 October - an unheard-of amount of time. The first prototype, Natter Versuchsmuster 1 (Baumuster1 (BM1)), was just a manned glider. After some tinkering (the undercarriage caused flight problems), the design was proved aerodynamic. 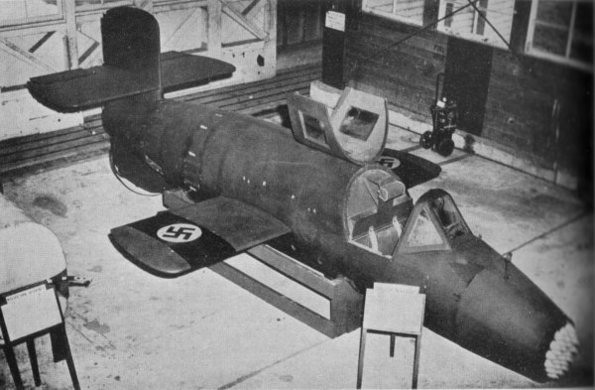 With the clock ticking, Bachem was forced to put a Walter HWK 109-509 A1 motor into a prototype (the number of them produced is disputed, but at least a couple dozen were built). A young German test pilot, Lothar Sieber, stepped forward and volunteered to fly the untested Ba 349 M23. The craft took off like the rocket it was, and it flew. However, at the 100-meter level it assumed an inverted angle, though it kept climbing. The motor stalled after the Ba 349 reached about 1,500 meters in altitude. It then nosed-over and slammed into the ground with terrific force. Lothar Schmidt thus became the first man to ever ride a rocket off a launch pad - not a milestone you will see in standard history books - but it was a one-way ticket for this true pioneer. Bachem theorized that the problem lay not with the fundamental design, but with the pilot, who pressed back on the control stick under the intense 3G acceleration and disrupted the flight, which otherwise was going smoothly (like Evel Knievel at Snake River Canyon in 1974). There were also some other issues - the cockpit latch may have been too weak, causing it to fly off during takeoff - but all the flaws seemed surmountable. 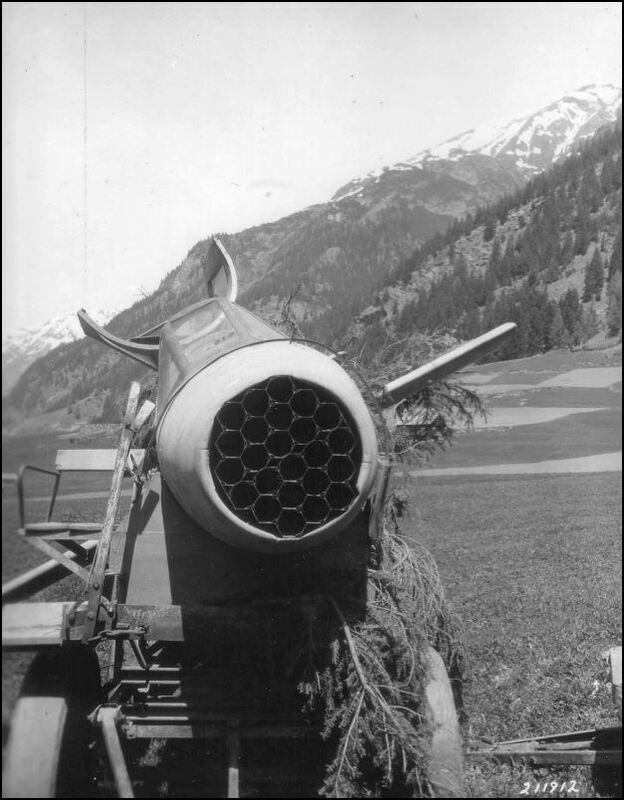 Work continued, and Bachem's factory at Waldsee produced 36 of these rockets. However, by now time truly had run out. The French captured the Waldsee factory on 25 April 1945 and destroyed most of the 16 Natters that hadn't been used up in testing. Some Bachem workers, however, took prototypes and brought them to the Americans in the Austrian Alps, presumably as bargaining chips of some sort. There are some tangible remnants of the program besides photographs, proving it was not just some wild tale of German UFO freaks. The Smithsonian has a complete Ba 349A-1 at the Paul E. Garber Preservation, Restoration, and Storage Facility in Suitland, Maryland. It was captured by US troops at St. Leonhard im Pitztal, Austria in May 1945. Another, built from spare parts after the war, is at the Deutsches Museum. All other versions are replicas. 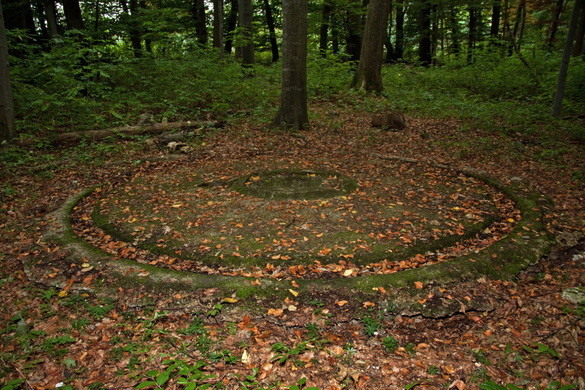 In addition, there are Natter launch pads in the Hasenholz forest south of Stuttgart just south of the motorway near Stetten am kalten Markt. You'll have to really look hard to find them, but they are there and arranged in a triangle. Another launch pad is on a military base. It was a very real and potentially successful program. This is the surviving example, which the factory workers spirited into the Alps to present to the Americans. It is known to reside somewhere in the Smithsonian Museum, likely at a warehouse in Maryland. It would be nice if they restored the survivor and put it on display. The Ba 349 really is a piece of aviation history. 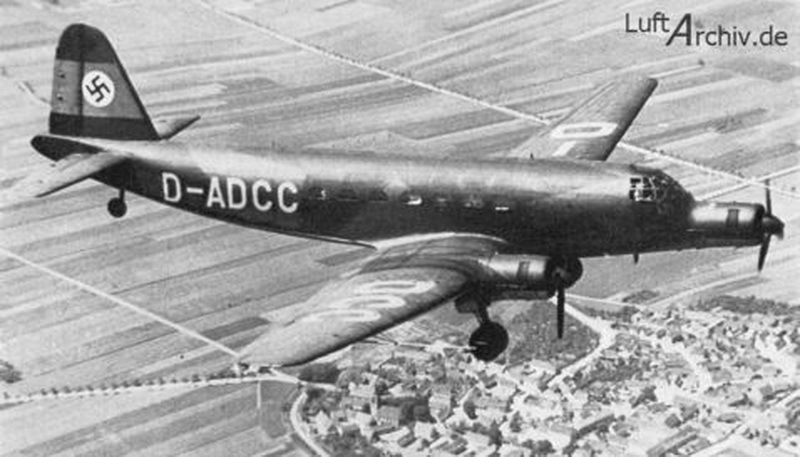 The Junkers Ju 287 featured a revolutionary forward-swept wing. This jet bomber may look fairly normal sitting on the runway, but it is like looking at an iPad in a Renaissance painting. It was powered by four Junkers Jumo 004 engines, making it one of the very few planes of the period to feature more than two jet engines, and it even had the advantage of being made of parts scavenged from other planes. The swept-forward wing was suggested by the project's head designer, Dr. Hans Wocke. 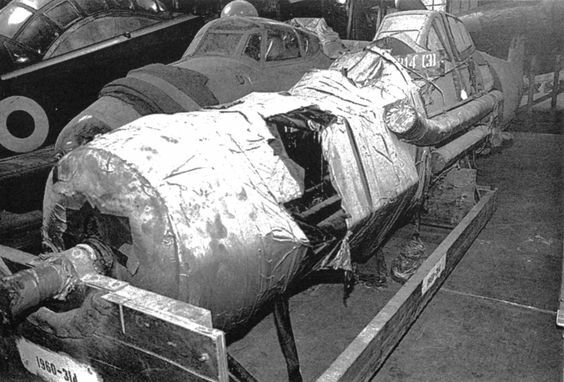 The prototype was assembled from the fuselage of an He 177 A-5, the tail of a Ju 388, the main undercarriage from a Ju 352, and nosewheels taken from crashed B-24 Liberators. Two of the Jumo 004 engines were hung under the wings, with the other two mounted in nacelles added to the sides of the forward fuselage. Seventeen flight tests were completed, and a maximum speed of 660 kph. The Ju 287 flew well, but the Germans did not have time to develop it. The only completed prototype finally was destroyed in a bombing raid, but the Soviets picked up two other partially completed versions which were somewhat improved. The forward swept wing design, while studied by the United States and the Soviet Union around the same time, did not become practical until advanced composites and computer technology flourished in the 1980s and the 1990s. The Junkers Ju 52 was the workhorse of the Luftwaffe. It is one of the classic designs of aviation history, and a few even remain flying today. However, by the early years of the war, its technology had been overtaken, so Lufthansa asked Junkers to modernize it. 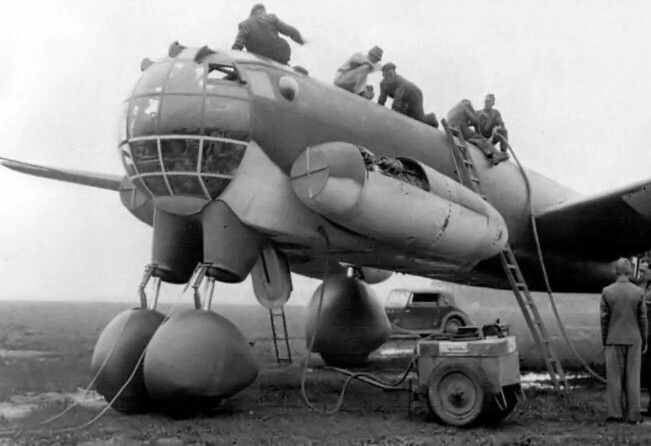 The Ju 252 came in twice as heavy (13,100 kg vs. 5,600), over 100 km/h faster (440 km/h vs. 305), and with dramatically improved range (3980 km vs. 1300) when fully loaded. The improved performance was largely due to an upgrade of the engines to three Junkers Jumo 211Fs. The prototype was ready for flighty by October 1941. 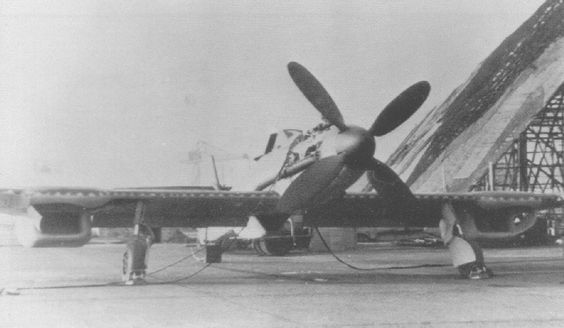 A total of fifteen Ju 252s were completed. Unfortunately for posterity, the design used too many scarce resources, so the design was downgraded to use wood and inferior engines. This resulted in the Ju 352. The redesign was a success in terms of using less strategic material, but an inferior plane. While the plane was cheaper and made out of wood which was readily available, performance metrics for the Ju 352 were all inferior to the Ju 252. Still, it was better than the Ju 52, so it went into production. Only 10 pre-production Ju 352's and 33 production Ju 352's were built. With the war going poorly, the project was shelved, and the Luftwaffe made do with the ol' reliable Ju 52. The He 111Z Zwilling ("Twin") was a purpose-driven design that entailed the merging of two He 111s. 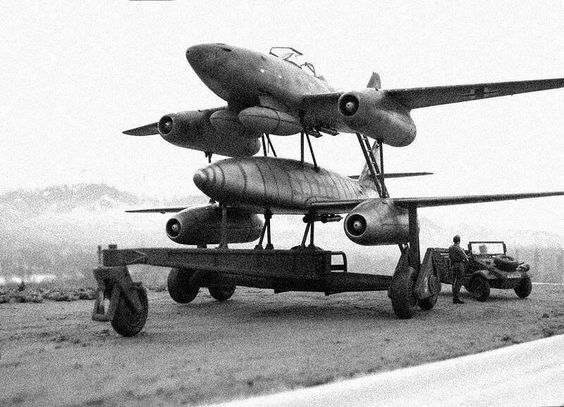 A need arose to tow the huge Messerschmitt Me 321 glider. It was a tough problem to solve, and all sorts of solutions were tried. 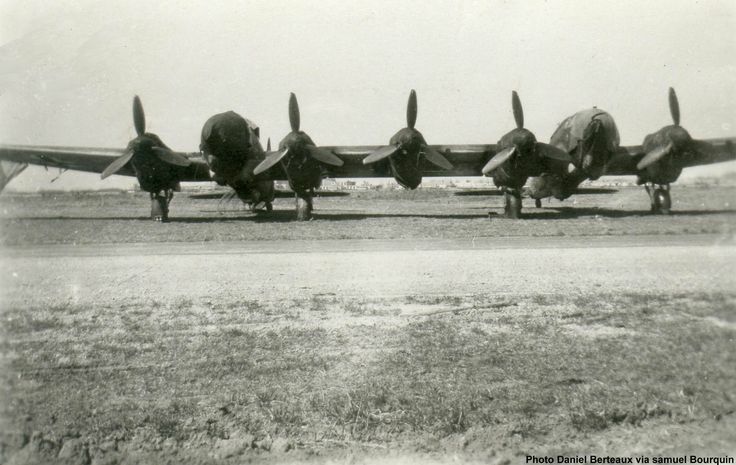 They even hooked up multiple cables to three Bf 110s in a so-called Troikaschlepp arrangement. This was extremely dangerous, required talented pilots and, more importantly, did not provide sufficient range. To solve the problem, someone came up with the idea of combining two He 111s, which were in plentiful supply and rapidly becoming obsolescent for operations, and adding another engine in between. The engines were five Jumo 211F engines at 1,000 kW (1,340 hp) each. The design worked, and two He 111Zs were built. However, the entire thing was unwieldy, and Messerschmitt ultimately just added engines to the Me 321 glider to create the Me 323. The completed He 111Zs were used for various towing missions, and more versions were contemplated for reconnaissance and as a long-range bomber, but the project ultimately was abandoned as the war situation deteriorated. Horton Ho 229 Flying Wing. Only jets could even consider meeting these requirements. Fortunately some jets were becoming available. 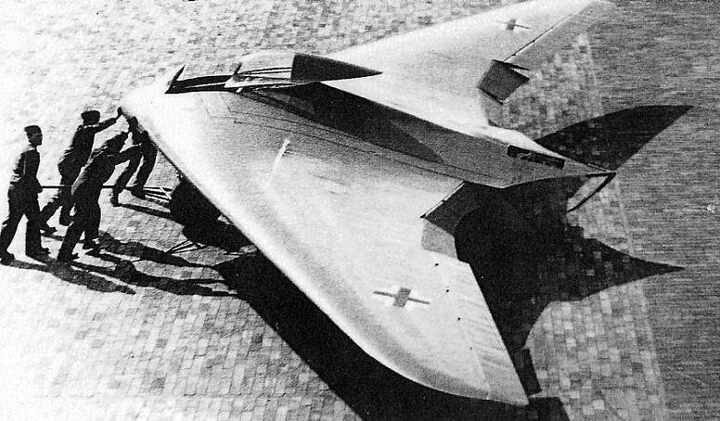 The Horten brothers came up with a flying wing design that looked nothing like any other aircraft at the time. Goering gave the go-ahead, and production of prototypes began. A completed version, the Junkers Jumo 004-powered second prototype H.IX V2, had two successful test flights. Reportedly, it engaged in a simulated dogfight with the vaunted Me 262 and out-performed it. The prototype crashed on the third test flight due to engine troubles - quality control of the early jet engines was always problematic. Still, the design had been proven sound, and in late March 1945, the Ho 229 was included in the Jäger-Notprogramm (Emergency Fighter Program) for accelerated production of inexpensive "wonder weapons." The Ho 229 V3 was in the final stages of completion when the war ended. The US managed to find the plane and keep it away from the Soviets, who surely would have loved to have taken it back to Moscow. The Ho 229 V3 survives. It is at the Smithsonian NASM's Steven F. Udvar-Hazy Center, awaiting full restoration. Oh, and that problem that the Ho 229 solved that the designers didn't even know existed? The Ho 229 incorporated stealth technology which reduced its radar signature by around 20%. This technology was not even considered by US designers until the 1980s. Blohm & Voss BV 141 (Ang, Federal Archives). The Blohm & Voss BV 141 was a World War II German tactical reconnaissance aircraft which was one of the very few asymmetrical aircraft ever built. Blohm & Voss (Hamburger Flugzeugbau) chief designer Dr. Richard Vogt came up with the design in the late 1930s. The theory behind the odd design was that the observer would have a clearer field of vision in a separate gondola on the starboard side. 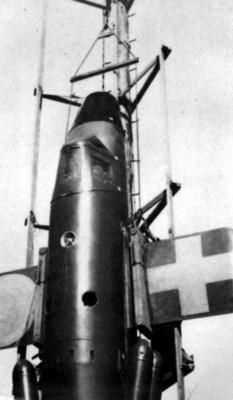 The tailplane was truncated on that side to give the rear gunner a better field of fire. The BV 141 takes off. This apparently was an early version with horizontal stabilizer going all the way across. Ernst Udet, in charge of Luftwaffe production, loved the BV 141 design. Three prototypes and an evaluation batch of five BV 141As were produced. Ultimately, though, it was decided that the Bv 141, with a BMW 801 engine, was under-powered despite the performance excelling in virtually every other area. The engines also were in short supply and needed for fighters. The Focke Wulf Fw 189 was used for the missions instead. In any event, the Luftwaffe's problem wasn't an inadequate number of planes - but the fuel and men to fly them. Dr. Vogt came up with other asymmetric designs, but none were produced. A total of 20 BV 141s were built, but none survive - though the British apparently brought a damaged version back to England for study. As the war entered its middle phase, Allied air attacks became a huge concern for the German high command. It wasn't so much that they were destroying valuable facilities and killing German civilians - which they most certainly were - but that they were relentless, the trend was for increasing attacks, and there was no way to stop them. Something had to be done, and fast. What followed was more a case study in corporate rivalry and changing priorities than aircraft design. The Messerschmitt company had begun work on a new fighter for naval use in 1942. The Kriegsmarine had absolutely no experience with aircraft carriers, and the initial idea was just to use standard Bf 109s adapted for carrier use. This was easier said than done, so for efficiency the Messerschmitt designers worked up a new fighter design with a more powerful engine that basically was just an outgrowth of the Bf 109. This guided early development, but the entire theory behind the project collapsed as the work on the Kriegsmarine's aircraft carriers such as the Graf Zeppelin was gradually shut down in 1942-43. By early 1943, the pressing need had switched to blunting the Allied bomber swarm, so the Reichsluftfahrtministerium (RLM) decided to adapt the promising fighter design to its new need - high altitude interception. The RLM finally was beginning to realize that time was growing short, and thus shifted the project to the aircraft subsidiary of Blohm & Voss - which wasn't nearly as busy because, well, its own designs hadn't been as successful. In fact, B&V had originated as a shipyard which had branched out into military aircraft production due to the German rearmament programme of the 1930s. Its specialty was flying boat construction. Perhaps one of the reasons the project was given to B&V was because of the original naval connection - which, with the new goal of land-based used, had disappeared completely. However, it had the people available to work up the design, even if they weren't ideally suited to the project. 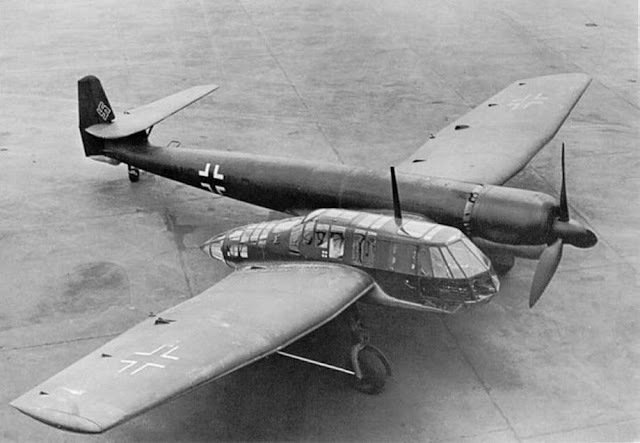 The plane's evolution was supposed to be a joint project between the two companies, and B&V needed the help because project used so many Messerschmitt components. However, the Messerschmitt people resented losing the project and did the usual passive-aggressive things that show displeasure - missing meetings and so forth. By late 1943, the collaboration had collapsed completely, leaving B&V holding the bag. B&V finally decided just to eliminate a lot of Messerschmitt parts, such as the Bf 109 wings and canopy. The RLM accepted the changes, and the new designs certainly provided marginal improvements, but crafting new parts eliminated the efficiency of using off-the-shelf components. This stretched the project out, and time was not something the Germans had in abundance as bombs rained down on their cities and factories. 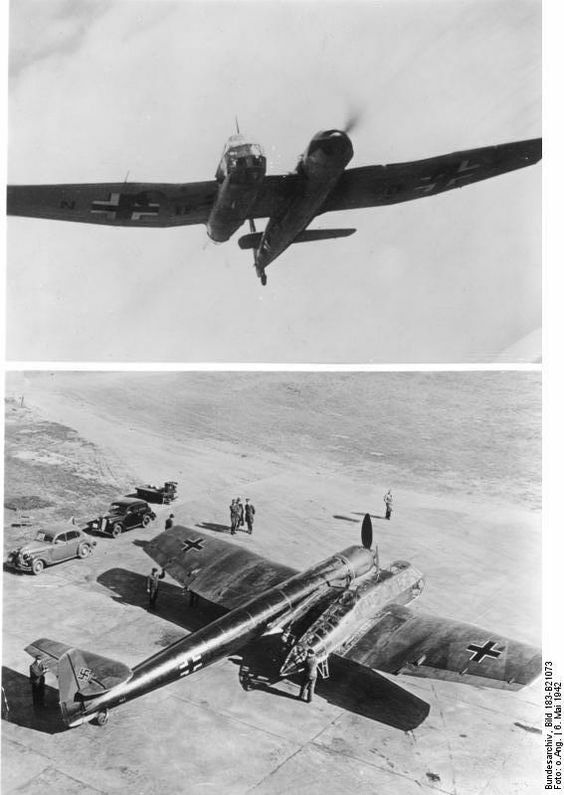 The BV 155 V1 flew for the first time on 1 September 1944. The outboard radiators from the Messerschmitt design proved too small, and after redesign (including the new canopy and larger rudder) the BV 155 V2 flew on 8 February 1945. The engine went through numerous changes, with Blohm und Voss finally settling on the DB 603U, with power of 1,238 kW (1,660 hp) for takeoff and 1,066 kW (1,430 hp) at 14,935 m (49,000 ft). The project was continuing toward a promising conclusion when the war ended, but even if it had entered service the BV 155 was adequate but never a war-winning design. Focke-Wulf Fw 189 Uhu ("Eagle Owl"). The Focke-Wulf Fw 189 Uhu ("Eagle Owl") was an excellent design. A twin-engine, twin-boom, three-seat tactical reconnaissance and army cooperation aircraft, it first flew in 1938 (Fw 189 V1), entered service in 1940 and was produced until mid-1944. This was a major project by the Luftwaffe, and 864 were produced. Kurt Tank, famous for the legendary Fw 190 fighter, came up with the design. Rear view of center section. While extremely maneuverable, which got it out of many entanglements with Soviet fighters, it also was relatively slow for a recon plane (357 km/h at 2,600 m (222 mph at 8,530 ft)) and thus unsuitable for the Western Front. In addition, all were destroyed during the war, and thus no examples remained to be viewed and photographed in the post-war period. Thus, the 189, despite its extensive use, is not famous in the West because it was used primarily on the Eastern Front. Fortunately for posterity, in 1991 one was found in a Russian forest. It had sat there undisturbed since 1943, when it crashed. The pilot, Lothar Mothes, had been the sole survivor, walking out of the forest and evading Soviet patrols to get back to base. Mothes was still alive when it was found and reunited with his old mount in 1996. Reportedly, Paul Allen of Microsoft fame bought the wreck for his World War II museum, but it is not on display, at least not yet. Helicopters were a hotbed of development in pre-war Germany. They had many potential uses: the Kriegsmarine, for instance, wanted gyrocopters on its submarines so that it would be possible to spot targets otherwise over the horizon. After being forced out of his own company by the Germans, Henrich Focke of Focke-Wulf created a new company, Focke-Achgelis, specifically for helicopter development on 27 April 1937. His partner was Gerd Achgelis, a pilot. They came up with the Fa 223, nicknamed Drache ("Dragon"). It had a twin-rotor layout, and the first prototype flew on 3 August 1940, right as the Battle of Britain was getting underway. Serial production of the Fa 223 began at the Focke-Achgelis factory in Delmenhorst in 1942. The Allies were keeping close tabs on the project and bombed it later that year, destroying all the versions being produced. A new plant was set up at Laupheim, near Ulm. Several demonstrations flights were later made. 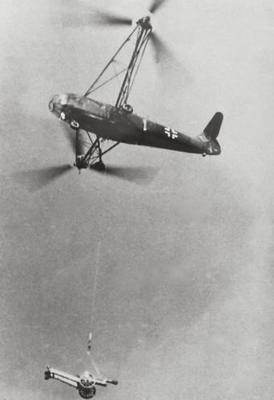 Loads which included a complete Fieseler Storch aircraft and the fuselage of a Bf 109 were lowered with great precision to vehicles using the Drache's winch and special quick-release electrical cargo hook. In addition, the Fa 223 was used on special missions, such as recovering a crashed Dornier Do 217 in early 1944. The Allies once again interceded and bombed the new factory in 1944. Five examples survived, and the US seized two. One accomplished the first helicopter flight across the English Channel on 6 September 1945. A few versions were completed after the war from surplus parts and under license. There were several advanced jet aircraft in various advanced stages of development towards the end of World War II. Many people know, for instance, about the Me 262 Swallow. The Messerschmitt Me 163 was not one of them. Instead, it was rocket-powered. 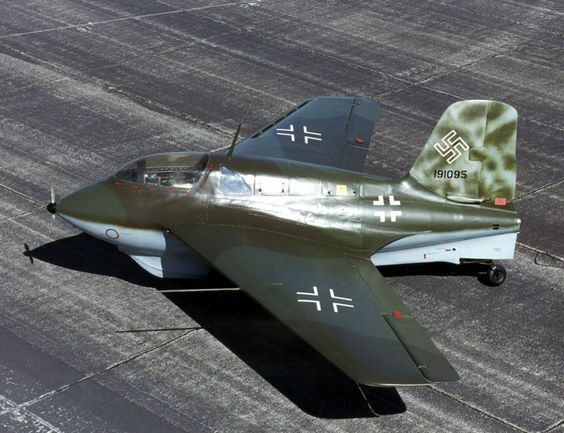 The Messerschmitt Me 163 Komet was designed by Alexander Lippisch. 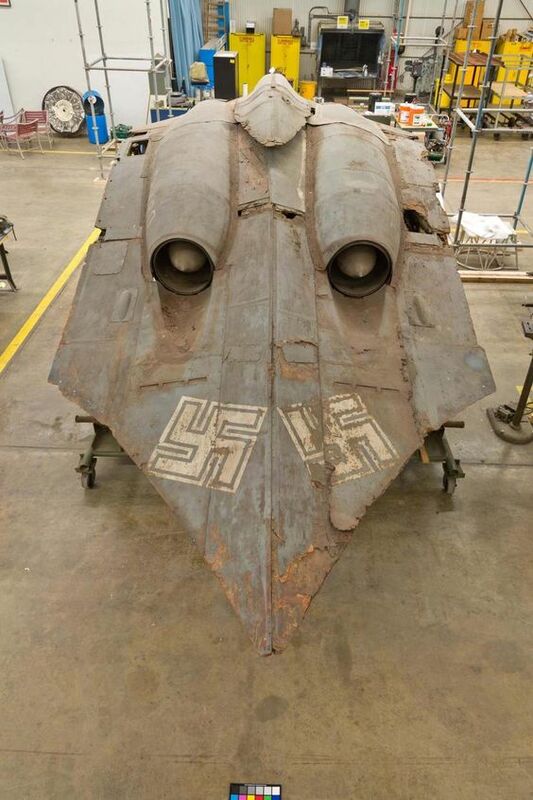 As with many exotic Luftwaffe designs, this one came from an odd direction. The design originated before the war as a project for the Deutsche Forschungsanstalt für Segelflug (DFS)—the German Institute for the Study of sailplane flight. In early 1941, the plane got the Me 163 designation and was worked on at Peenemünde. By 2 October 1941, the Me 163 set a world speed record of 1,004.5 km/h (624.2 mph), piloted by Heini Dittmar. 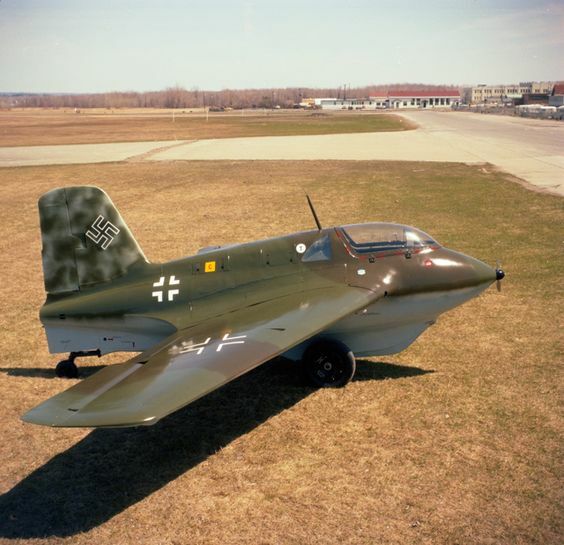 The Me 163 had extraordinary gliding capabilities. It would be taken quickly to altitude, then the pilot would shut off the engine and glide until he found a target and then glided down to a landing. Unfortunately, though, this gliding ability caused problems on landing, because the Me 163 would glide clear past the runway and then crash. The propellant was hydrazine hydrate and methanol, designated C-Stoff, that burned with the oxygen-rich exhaust from the T-Stoff, used as the oxidizer, for added thrust. Many explosions were caused when these two ingredients accidentally were mixed upon crash landings. The Luftwaffe loved the idea of the Me 163 and planned to have bases of them throughout Germany to combat the allied air forces. There wasn't enough fuel to fly them, and their odd flight characteristics required extreme skill in order to down enemy bombers. 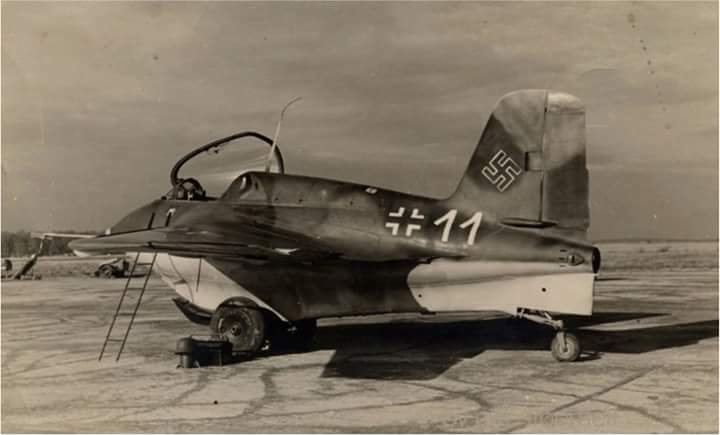 Ultimately, the Me 163 proved to be a dead end, but it did achieve reliable service history, shooting down 16 aircraft, mainly four-engined bombers, while losing only six to enemy action. Other air forces decided that the rocket concept was inefficient and never pursued the path cleared by the Me 163. About ten survive in museums around the world. Messerschmitt Me 163B-1a Komet – Canada Aviation and Space Museum. 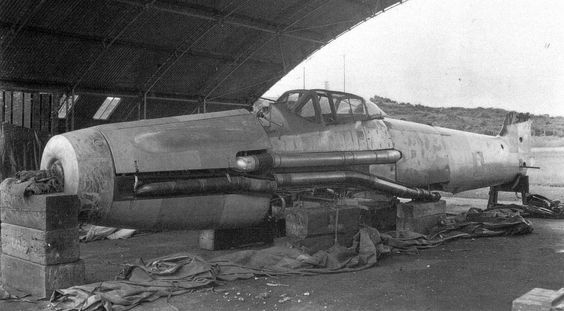 An Me 262 Mistel arrangement. 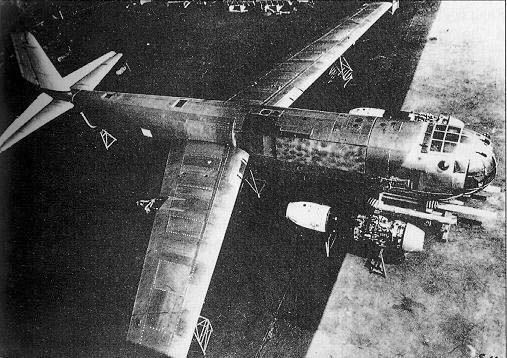 The Luftwaffe Mistel project combined a piloted aircraft with an unmanned plane filled with bombs. The pilot would fly within range of a target, release the unmanned craft, and then either fly away and assume it would hit the target, or under some circumstances guide it to the proper location by wire. 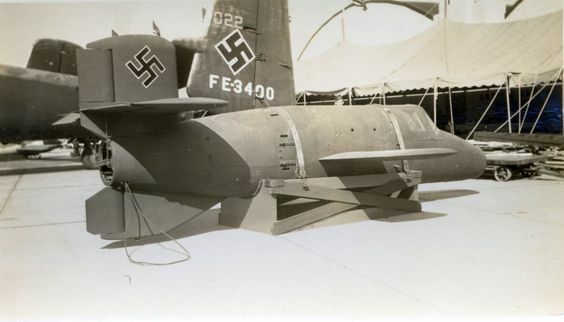 The "Mistel" was the unmanned flying bomb part, attached to the host by Kugelverschraubung mit Sprengbolzen ("ball joints with explosive bolts"). The Mistel was a mid-war project. They were available by D-Day, but did not achieve any known hits on the invasion forces. Another major contemplated use, Operation Iron Hammer, targeted Soviet power plants and weapons factories. With the Soviets closing in, though, the mission was changed to target bridges at Kustrin, the closest point of Soviet penetration into Germany at that point. The operation was implemented, but achieved very limited success and may have only held up the Soviets by a day or so. Basically, it was a project with high hopes, a "secret weapon," that fell flat when actually tried. 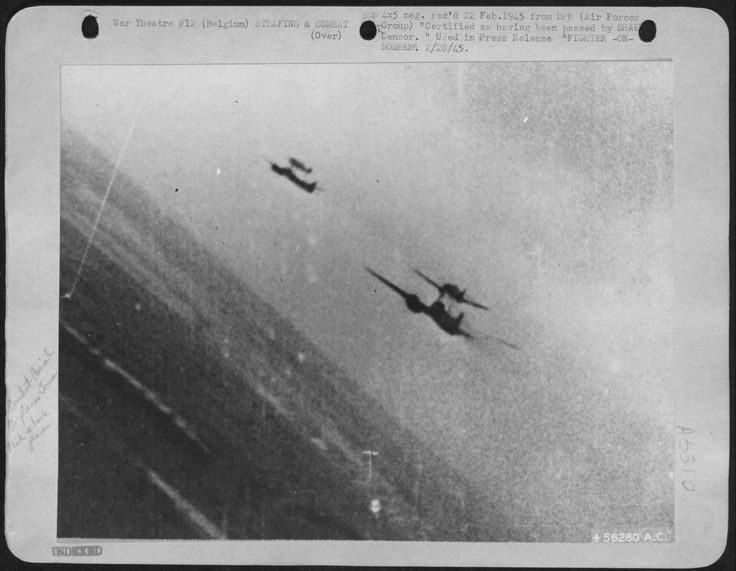 This is an extremely rare shot taken by an Allied pilot during the war. 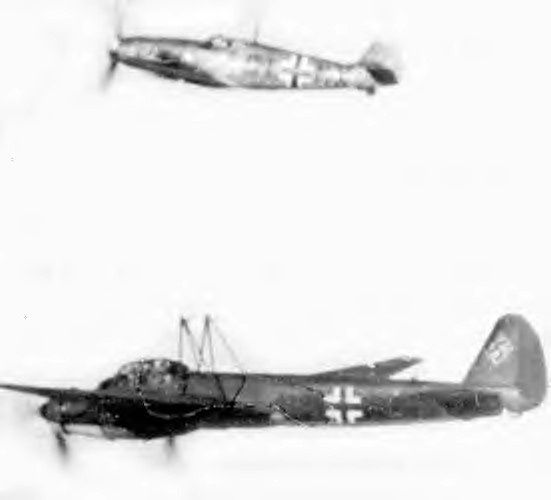 It shows two Mistel bombers caught by surprise on a training flight. The pilot was able to shoot one down. The Allied pilot couldn't believe what he was seeing. Several versions were formed. 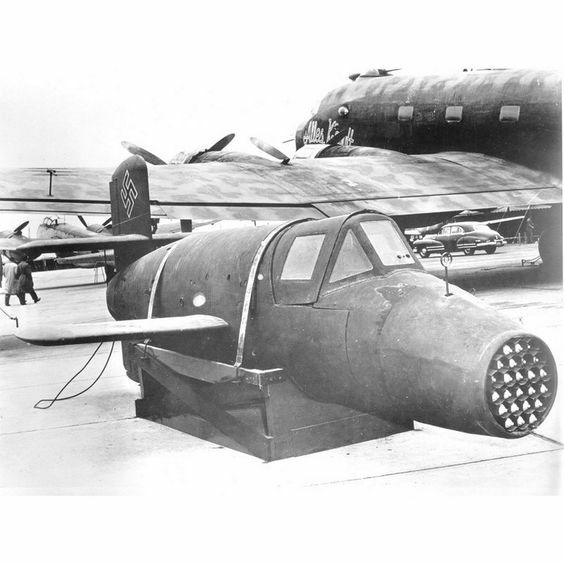 The most common used a Junkers Ju 88 bomber as the Mistel, or flying bomb part. Other variants were Ta 154/Fw 190, Ar 234/Fi 103, Do 217K/DFS 288 and Si 204/Lippisch D-1. Projects included the Ju 287/Me 262 and Ar 234C/Arado E.377. The most interesting version was the Me-262 "Mistel" (Mistletoe), a flying-bomb version of the Me-262 with no cockpit, a warhead in the nose, and a simple autopilot system. 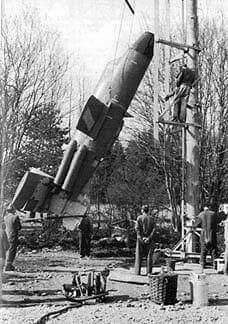 The flying bomb was to be controlled by a piloted Me-262 attached to a frame on top, with the whole clumsy assembly taking off on a big trolley that was dropped after take-off. 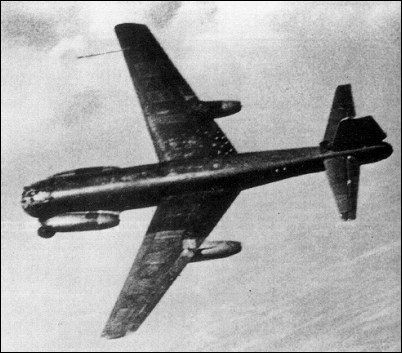 The piloted Me-262 would release the flying bomb after pointing it at a target. A Bf 109 fighter releasing a Ju 88 Mistel. The Dornier Do 335 Pfeil ("Arrow"). 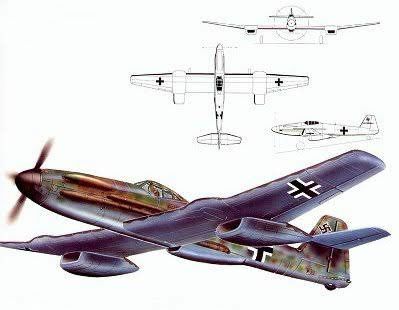 The Dornier Do 335 Pfeil ("Arrow") was the ultimate expression of a pet idea of German aircraft designers: that having engines in-line would be more efficient by reducing drag. The idea did not always work well, the greatest example of that being the Heinkel He 177 (aka the "Flying Fireworks"). However, in the Do 335, the idea worked, and worked gloriously. The Arrow was was Germany's fastest piston-engined aircraft of World War II. Maximum speed: 765 km/h (474 mph), and the plane had a service ceiling of 11,400 m (37,400 ft), which could enable it to fly above most enemy planes before attacking. While its speed could not match the jet planes such as the Me 262 (Maximum speed: 900 km/h (559 mph)), it comfortably exceeded the best Allied fighter, the North American P-51 Mustang (437 mph (380 kn, 703 km/h) at 25,000 ft (7,600 m)). Claude Dornier was a big fan of the tandem-engine layout. He had been using the concept in flying boats all the way back to World War I. He could have had the fighter ready sooner, but the Luftwaffe kept changing its priorities. In early 1940, in fact, Hermann Goering cancelled all projects that could not be completed within a year. The project was re-started later, and Hitler himself took an interest in it. On 23 May 1944, Hitler, as part of the developing Emergency Fighter Program (Jägernotprogramm) directive which took effect on 3 July, ordered maximum priority to be given to Do 335 production. 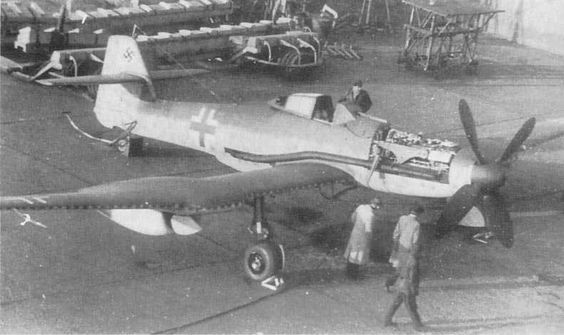 Dornier, though, still faced delays caused by both the Allies, who bombed his factory, and his German competitors, who frustrated the attempts to give the Do 335 priority. Despite the delays, the first 10 Do 335 A-0s were delivered for testing in May, and the Do 335 A-1 (with improved DB 603 E-1 engines) was on the production line by late 1944. Delivery commenced in January 1945, but it was too late to train pilots and get a squadron operational. Only 11 fighters and two trainers had been delivered by the end of the war. The only Allied fighter known to have encountered the Do 335 said it just sped away and he couldn't catch it. Only one Do 335 is known to survive (though there is a likelihood one or two are in private hands). It is is on display at the Smithsonian at the Steven F. Udvar-Hazy Center of the National Air and Space Museum.